Posts Tagged "Vidal Sassoon Box Bob"
Home » Posts Tagged "Vidal Sassoon Box Bob"
Top Left to Right : Louise Brooks with her signature bob, in the 1929 movie “Diary of a Lost Girl” …Carole Lombard in the 1929 movie “High Voltage.” … The first layered bob by Kim Lepine, La Coupe, 1978 … Gwyneth Paltrow’s bob with bobby pin, 1996, by John Sahag, John Sahag Workshop … Gwyneth Paltrow’s lob by John Sahag, 1998. 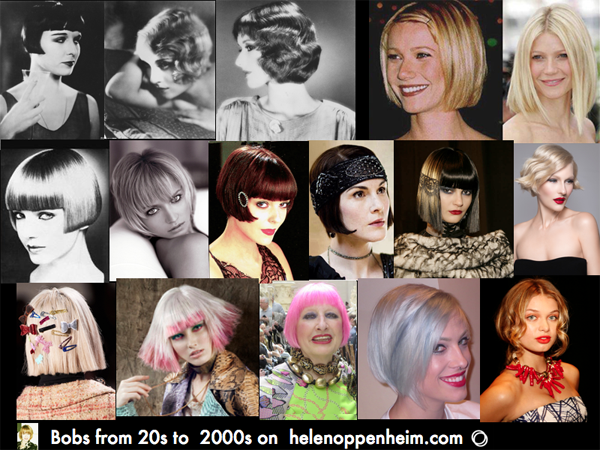 Center Left To Right : Vidal Sassoon’s famous Box Bob, 1965 … The best bobs in the biz are now by Edward Tricomi, Warren Tricomi, this one, 2005 … Bob with ’30s buckle accessory, by Kim Lepine, La Coupe, 1993 … Bob with bandeau on Michelle Dockery as Lady Mary Crawley in Downton Abbey (watch for the movie scheduled to be released September 13, 2019 ) … Laced bob wig by WorldGreat Peter Gray for Betsey Johnson’s NYFW Show, Fall 2011 …Bob with movements by Sherri Jessee, Bristol, VA, 2017. Bottom Left To Right: Bob with barrettes, by Thomas Osborn, Air by Catwalk, TIGI, for Libertine NYFW, Fall 2016 … Boho Bob by WorldGreat Vivienne Mackinder, in platinum snow with shades of rose and violet, color by Beth Minardi for Intercoiffure AC, 2012 … British fashion designer extraordinaire, Zandra Rhodes with a pink bob at the Metropolitan Museum’s Punk To Couture Exhibit Press Preview, 2013 … Bauhaus Bob in gorgeous grey blue colors, David Kinigson, The David Space, West Palm Beach at Intercoiffure AC, 2015 … and for those who will not chop, here is the faux bob by Jorge Luis for Luis Antonio’s NYFW Spring 2015 show. Full credits on website for all except Vidal Sassoon’s Box Bob photo by Barry Lategan.